We are women of all ages who have responded to a personal invitation from Christ to dedicate our lives to Him as Ursuline Sisters. We continue to live the vision of Angela Merici, an innovative woman who in 1535 saw a new way for women to consecrate their lives to God while continuing to live in the heart of family and society. After a period of initial formation each of us professes three vows for life: chastity, poverty and obedience to be lived in the spirit of Angela Merici which she described in her personal writings – the Primitive Rule, the Counsels and her Testament. Living in an Ursuline community we find a place of belonging, inspiration, encouragement and challenge. At the heart of each community is prayer: communal and personal. Sharing faith and prayer together energise us to face the questions and challenges of everyday living. 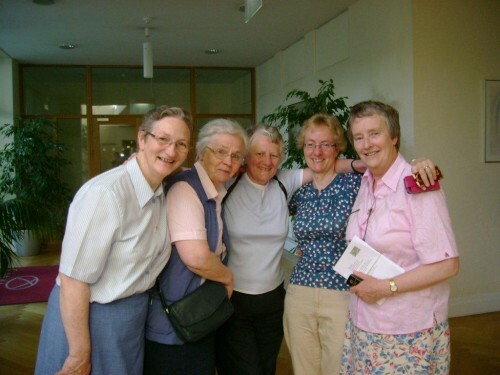 Taking time to understand one another, to support one another in difficult times and to rejoice together in happy events, cultivates that spirit of mutual love and unity which lies at the heart of the Ursuline charism. This is what we strive to live and witness in our communities. The primary mission of an Ursuline Sister is to realise God’s love for her, to offer her love in return and to share that love with all whom she encounters. Traditionally in Ireland, educational needs at primary, secondary and tertiary levels provided the channel for our ministry. In more recent times, in accord with Angela’s own advice to us to adapt “to the signs of the times” and to respond to the needs of our time and place, some sisters have undertaken new ministries: health care; pastoral work in parish and diocese; prayer, retreat, spiritual direction and counselling; work with marginalised people – the poor, prisoners, the homeless and immigrants. Ursuline sisters are ever open to new challenges and continue to discern relevant ministries requiring a valuing of individual gifts allied to a careful reading of the needs of our changing world. The constant mission underpinning all our ministries, traditional and new, is to share the good news of Jesus Christ with all people.